TO This article has recently been imported from the German C64-Wiki and not been translated yet. Please come back at a later time to read the English version of this article or help us. 6.75 points at 28 votes (rank 417). 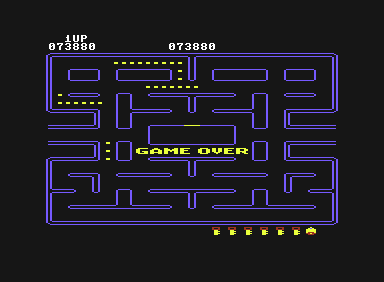 Rombachs C64-Spieleführer 8 September 1984 - "2"
In 1983 the first Pac-Man conversion of the arcade blockbuster Pac-Man (from 1980) was realeased for the C64 by Namco under Arialosoft. In the first game the yellow smilie Pac-Man had to collect all dots inside a labyrinth by eating them. At the same time he needs to watch out for the 4 ghosts named Blinky aka Shadow, Pinky aka Speedy, Inky aka Bashful and Clyde aka Pokey that disturb him while eating and which cause him to lose a life when he touches them. 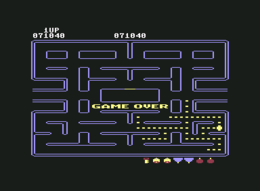 Pac-Man can change the side of the labyrinth through the tunnels attached at the sides and with this confuse the ghosts. Furthermore by eating the 4 energy points he can make the ghosts take flight for a short time and eat them. 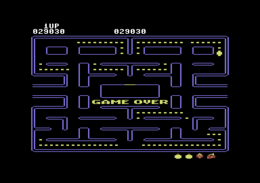 As a bonus every few minutes fruit appears at the starting position of Pac-Man. A round is done when all points have been eaten. With every new level the ghosts get faster and need to be caught more quickly. There are many versions of Pac-Man. Sometimes it is closer to the arcade version, sometimes it is more a 3D-labyrinth game or it is transferred to space surroundings. 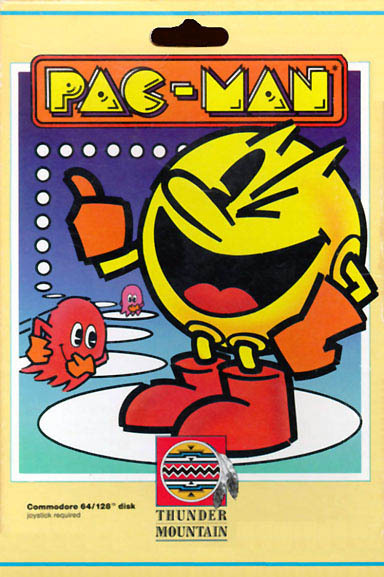 There are Pac-Man games for the most computer and console systems. 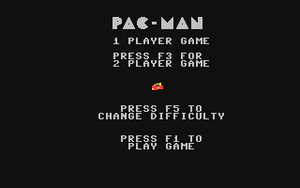 Some versions for the C64 are Ms. Pac-Man, Jr. Pac-Man Super Pac-Man and Pacmania. The design corresponds the arcade version, i.e. 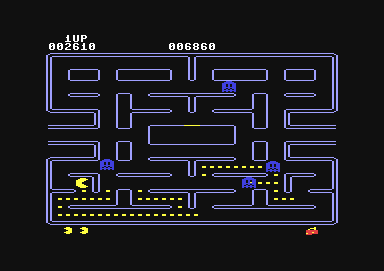 a blue labyrinth with yellow dots and a yellow Pac-Man as well as 4 ghosts in the colours red, pink, bright-blue (turquoise) and orange. Slight animation of the dots, Pac-Man and the ghosts. Nice intermediate animations for taking breath. As background music serves a wail that is complemented by sound effects. For eaten ghosts by collecting the energy dots you get 200, 400, 800, max. 1600 points. Every 10.000 points reached you get an extra life. There are special points for eating the fruit from 100 to max. 5000 points extra. Jodigi: "The classic, cult and always good for the diverting amusement. Even though other Pac-Man clones are often also tempting." Werner: "Bad controls, as Pac-Man sometimes keeps stuck in the corners. Boredom lurks, as the first levels are far too easy. 5 points from me." Robotron2084: The loveless graphics and the mising dynamics ruin the desire for more. Of course, the original didn't really look good either, but at least better than this porting. Otherwise it is quite o.k., but clearly stands in the shadow of Ms. Pac-Man, the definitely better conversion. Neither really good, nor really bad, therefore also 5 points from me." Shakermaker303: "A true classic of video games, unfortunately for the C64 converted in a suboptimal way." In the orignal there is a small blemish: in the title image the fruit that symbolizes the difficulty level is not shown in multicolour. This was repaired in the version by "Remember". Pac-Man in the Killer List Of Videogames. This page was last modified on 4 April 2019, at 21:29. This page has been accessed 37,109 times.